Just saw a story this morning about Carat’s advertising outlook for 2009. Even though they are revising their forecast down to reflect the weak economy, they are raising their forecast for online advertising from 23.3% to 23.7% in 2008. For 2009, they are predicting that online advertising will grow 18.6%, vs. earlier estimates of 17.8% growth. [Jerry Buhlmann, CEO of Aegis Media] said the growth in online’s ad spending share has less to do with the growth of consumer use of online media, and more to do with a secular shift within the advertising industry that is driving marketers and agencies toward media that deliver measurable returns on advertising investments. This shift to performance-based media, sometimes called ROI advertising, is going to continue until most (if not all) advertising is based on performance metrics. Not only is search advertising going to continue its phenomenal growth in leading this sector, but lead generation is going to continue to grow quickly. Joining them will be other media that traditionally have not been measured but will move in that direction, including video and even print. 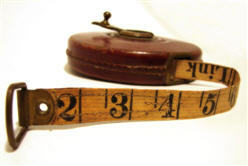 Marketers have always headed in the direction of measurable media programs. Just think of the 1-800 numbers that can be traced back to specific ads. With money tight, even more dollars will be adjusted to go to these programs that can prove they are worth the money they cost to run. It’s the weekend, so what better thing to do than to procrastinate using fun online apps? There were two that I have been eager to try – Yearbook Yourself (discovered via TechCrunch) and Mosaic Maker from Big Huge Labs (discovered via Non Society). What can I say? These apps are fun. With Yearbook Yourself, you can upload a recent photo, and use it to find out what you might have looked like if you graduated in the years 1950 through 2000. Some of the images of me are frighteningly close to home. 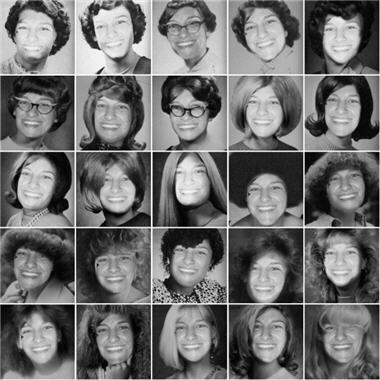 And I kinda wish that 1966 would come back because it turns out that I look groovy with a giant ball of hair on my head (second row from the top, fourth picture). I took the images created from Yearbook Yourself and uploaded them to Mosaic Maker to come up with this great grid of images. Both tools are fun. And if you Yearbook Yourself, please do share. My cousin Jay (hi Jay!) is in the process of building and launching his own online business, and he sent me a note this week (OK, he sent it two weeks ago, I’ve been busy!!) asking me about online advertising and how it works. I ended up writing him a fairly long-winded email in response, but I thought that there were enough nuggets in the message to make it worth re-posting. Here is a (somewhat edited) version of the email that I sent him. Please forgive me for the rough format. The most basic type of Internet advertising (which is sometimes called “online media” or just “media”) is the standard banner ad. 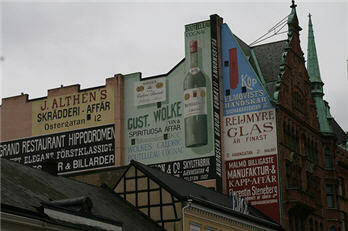 The banner ad has been around for years and was pretty much the first type of advertising that was sold online. When banners first went up, they got high click-through rates and companies could charge high fees for them, but the rates have dropped significantly over time. Banner advertising is usually sold based on a CPM (cost per thousand) basis calculated against page views. CPMs vary depending on the market that you’re in – consumer markets get a lower CPM than B2B markets – and they range usually anywhere from $10-$40 (approximately). The reasons that B2B audiences can charge a higher CPM is that there is the assumption that they are reaching a “higher qualified” more “high-value” audience. To sell this type of advertising, you’ll need quite a bit of traffic, and some information for potential advertisers about the type and quality of audience you reach. Demographics, reach, influence, etc. will all help. In the consumer market, advertisers are looking for a lot of reach – meaning high numbers of page views. Also, to run banner advertising on your site, you’ll need some kind of third-party ad server (a company that serves the ads and measures delivery and click-through for you), such as Doubleclick/DART. Also, it’s probably worth mentioning that “banner” advertising has evolved to include all kinds of ad sizes and types, such as skyscrapers & leaderboards (refers to ad sizes), interstitials (the type of ads that pop up as you go from page to page on a website), overlays, etc. If you are interested in running banner ads on your site, but you don’t want to have to sell the ads yourself, there are a lot of third-party ad networks that will use your available inventory (pages on your site) to run their ads, and you get a percentage of any revenue generated. This is a good option for early in a business when you don’t have the sales staff and technology resources available to do serious selling. Blue Lithium, Tribal Fusion and Casale Media are some companies that do this. If you don’t have the page views that you need to sell straight banner ads on a CPM basis, you might try to sell a site “sponsorship.” This is often harder to sell (especially these days) because with sponsorships you aren’t necessarily guaranteeing page views or any other measurable metric (although you could guarantee those things), but instead you are offering companies the chance to have exclusivity or sponsorship of a specific section of your site. Sponsorships can get complicated, but you can basically cook up any kind of arrangement that you can think of. Google AdSense is a great way for publishers (and Websites) to get started with online advertising. It’s easy to sign up for an account, and by setting things up and “playing with” Google’s tools and going through the training, you’ll pick up a lot of the online advertising terminology and best practices. It’s also the kind of thing that you can set up and forget – so it will just run and serve on every page of your site without a lot of interference. I run Google AdSense on many of my sites, and it does produce revenue – again, the higher the value the keyword and the more page views you have on your site, the more money that you’ll make. On the flip side (from the advertiser’s perspective) most marketers who do online promotion use Google AdSense (although when you use it to advertise, it’s called AdWords), primarily because it’s a type of “performance-based media” that shows advertisers/marketers immediate “ROI.” These two terms you will see again and again with online advertising, as the trend with online marketing moves to media that has measurable results. The other great thing about Google AdSense is that it will help you quickly be able to track your monthly traffic and page views and what your traffic is “worth.” So if you’re doing financial modeling you can include that data for potential investors. 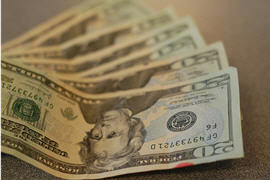 Another ROI-based type of online advertising is lead generation. Lead generation is when an advertiser/marketer pays you money to know more about specific members of your audience than just that they “viewed” an ad. With lead generation, advertisers usually get contact information (either email, phone, mailing address or all three), and other pieces of data that they consider to be valuable. With lead generation, companies are able to get anywhere from $10-$200 PER LEAD (as opposed to the $10 CPMs that I mentioned earlier), because the companies are willing to pay to know specifically who their potential customers are, and for the ability to market to them in the future. Lead generation works best on a site where users need to register to access data/services/etc. A variation on lead generation is co-registration, which is where a company that collects registration data can add a question or a check box on their registration form asking “would you like to receive information from X company?” If the user checks that box, they are “co-registered” for both your site and the other company’s site, as well. ONE WORD OF CAUTION ABOUT ONLINE ADVERTISING AS A BUSINESS MODEL. (This was applicable to Jay, but might be relevant to you as well, so I’m leaving it here.) Since you are building a site that requires users to enter a lot of data, fill out forms and generally interact with the site a great deal in order for the site to be successful, you will need to think very carefully about on which pages it makes sense to have advertising. For example, running Google AdSense is fine on an information page (a page that someone gets to and might realize that they are in the wrong place), but putting Google AdSense on a registration page, where it might distract a potential registrant from completing a form, is not the best idea. In that instance, getting them to complete the reg form is probably worth far more than having them click that Google AdSense link. I hope that this helps someone out there! If you have any questions, please feel free to post them below and I’ll try to answer. Mothers have a way of making truthful statements that bug the heck out of their kids. My mom was no exception. When I was growing up, one of her favorite things to tell me was “patience is a virtue.” Even writing the words today almost make me growl with disgust and slam the door. That’s the teenager inside of me, of course. I have fought a life-long battle with patience. I know that this story is not unique – very few people like to wait. But I’m writing about this now because I have enduring a trial that is requiring patience that I never thought I could muster – the patience needed to start a company. I had heard rumors of this before. My old boss Barry, a serial entrepreneur who was the CEO of Connexus Media, the start-up company that I worked for that was sold to Ziff Davis in 2004, has told me stories of his need for patience when we started Connexus. He used to drive to work in the mornings, and instead of turning into the parking lot, he would force himself to stay on the road and go to a diner, or golfing, or to run errands, or to do anything other than going into work. He did this because he knew that he could do nothing to move things along any quicker, and he feared that being in the office would only hurt progress instead of helping it. I have been working on Pure Incubation for almost a year. In that time, we’ve built a bunch of sites. But until this week, I had yet to launch any of the Web applications that we have been working on building for the past year. These delays rarely had to do with anything that I was working on personally. In most instances, I was just waiting for other people – application developers, designers, researchers – and they needed time to finish the work that they were doing. I should also mention that they weren’t taking a long time – they were taking a reasonable amount of time. I just had a hard time waiting when I was so eager to get going. Over the course of the past year, I have developed a series of strategies to help myself be more patient. These are just band aids. Honestly, most of them are just distraction techniques – they aren’t solving the root of the patience problem. But these strategies have really helped me stay steadier in the midst of waiting. And my hope (and fear, if I’m being honest) is that waiting will one day teach me patience for good. Get a hobby. This summer, I started taking tennis lessons. The lessons were two times per week, 10:30am-noon. This chunk of time out of the middle of the day didn’t really take away from the amount of time that I worked – I just put in the hours later into the night – but getting away from the office helped to readjust my attitude. I was able to remind myself that if things were moving faster I wouldn’t have been able to take tennis lessons in the middle of the day. And since I enjoyed the experience, it made the waiting more tolerable, as well. Not to mention that it helped my tennis game. Start a blog. Quick disclaimer: I didn’t start this blog to help myself be more patient. But this blog has helped with the waiting, and has also turned into a powerful tool for my business. Taking the time to think of posts and write them out has been instructive, and having the time to dedicate to my blog reminds me again that moving slowly isn’t such a bad thing. My blogging productivity seems to wane and wax depending on how busy I am, but developing the discipline of blogging has been a way to stave off impatience – while benefiting my business at the same time. Do consulting. If you pick the right projects – the kind that teach you something new while paying you to learn – consulting will help you be more patient about the rest of your business. Consulting will give you more work to do (filling some of the hours of waiting), and will also fill the bank account with some cash. For me, part of the difficulty with waiting was the delay in making money, so having something to do that also gave me some much-needed capital was a double win. Even though consulting can be difficult at times, it has helped me have more patience in waiting for my core business to become profitable. Travel. It’s difficult to take a week away from the office when your business is busy and things are moving quickly. So taking the opportunity to travel – even if it’s a trip in which you’re working from wherever it is that you travel to – and get a change of scenery and have some fun. Remember that you’re part of a team. Because I work alone, and have part-time people, consultants and contractors working with me, it’s easy to begin to feel like I’m the only one that cares – which leads to a great deal of impatience. When this happens, I have to remind myself that I’m not alone, that my team is in this with me. I usually give one of them a call (preferably a team member that is supportive and will understand the up’s and down’s I’m going through). This not only helps me reconnect with my team, but it also reminds me that the people I’m waiting for are human, too. This helps increase my patience as I wait for them to get their work done. At the end of the day, entrepreneurs need to remain dedicated to their vision and plans through all the ups and downs and changes that take place. 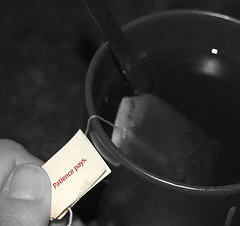 And having a little bit of patience – OK, a lot of patience – is really important in reaching the final goal. Just a quick heads up to all you bloggers out there that signups are now going on for Blog Action Day 2008. 16th Letter participated in this last year, and it was a very cool thing to be one of thousands of blogs all writing about the same topic on the same day. Last year’s theme was the environment, and this year we will be tackling the issue of poverty. Head over to the site to sign up your blog. This type of event is one of my favorite things about the Internet – doing something small that turns into something so much bigger than just myself because of the number of participants. Anyway, hope that you’ll be a part of it! This is smart online marketing. Holding out a carrot like the VP candidate – an issue that has been debated and talked about so much – is just smart. So, after following Obama on Twitter (“he” reciprocated the follow within minutes), I went to the Web site link that was posted. Again, a stroke of marketing genius. Because even if I am not going to vote for Barack Obama, I really want to be in the group of people who are the first to know who his running mate is going to be. So I gave up my email address. And my phone number. 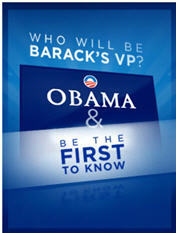 And now Obama’s campaign can continue to market to me from now through November. “How do kids find new music?” is the question that I set out to answer in my article for The Industry Standard this week – “Tweens, teens increasingly turn to MySpace, iTunes, and illegal P2P services for music.” Go have a read if you’re interested in what I found. In the course of researching and writing that article, I couldn’t get Disney out of my mind. Even though I don’t mention Disney in the article, the entertainment and media giant was there, framing every thought. Disney is the champion of the tween market, not only with its TV programming but also with its music efforts. At a time when the music industry is faltering, Disney’s success in the music industry is only growing. According to an article on CNET, Walt Disney Records’ music sales grew 60% from 2006 to 2007 due to the “tween and young-teen music craze led by Disney star Miley Cyrus.” This was at a time when music sales were down 17% overall. And Cyrus (aka Hannah Montana) is joined by other Disney hits in appealing to the tween crowd. Along with 2006’s High School Musical, the boy band group The Jonas Brothers is set to be another huge sensation for Disney. 1. Fake it ’til you make it. When Disney introduces a new potential star to its audience, it makes sure that the nobody looks like a somebody from the first moment they are introduced. The singer is usually introduced in a short-clip music video or concert during a commercial break on the Disney Channel. That video shows a huge crowd of adoring, hip, teenage fans screaming and swooning for the “star.” This crowd is made up of paid and wannabe actors, and the music video is usually shot in a studio. But it looks like the singer is a star, and more importantly people believe the singer is a star, even before it is true. 2. Be yourself. Part of the appeal of the Disney stars is that they seem so real. Because of this, they appeal to both tweens and their parents. And to maintain that image in front of so much media scrutiny, it’s likely that the stars are mostly just being themselves. Sincerity is appealing, and operating a business that you believe in and behaving with integrity while operating it will help attract – and keep – customers. 3. Remember that you’re building a brand. While Disney stars may be “being themselves,” they are never outside of the watchful eye of the media, and as such have to behave in a way that will build their brand – always. One little slip up (such as Cyrus’ photo incident with Vanity Fair), might be able to be overcome with an apology. But constant deviations from your brand will leave your customers confused and angry. 4. Piggyback on previous success. The Jonas Brothers, Disney’s up-and-coming prospects who you often hear compared to The Beatles (at least by Disney), first toured as the opening act for – Hannah Montana. By piggybacking on the success of one musician, Disney was able to launch the careers of another group that appeals to the same demographic. In the same way, piggyback one business success off of another whenever possible. 5. Let your customers in on the action. One of the biggest reasons that High School Musical was so popular was that it invited everyone in to learn the songs and the dances. Both fans and customers want to be included, so figure out ways to draw your audience in and let them participate every chance you get. “Wi-Fi doesn’t stand for anything. It is not an acronym. There is no meaning. According to Internet.com, some of the losing names that Interbrand suggested were Skybridge, Torchlight, Flyover, Transpeed and Elevate. 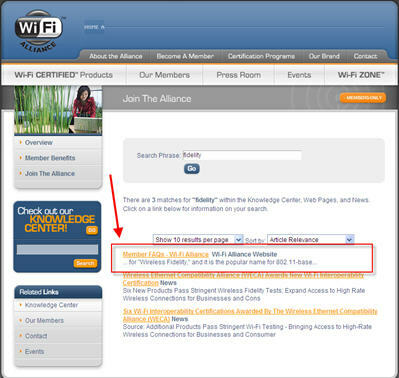 UPDATE: Thanks to an awesome comment by a reader (Thanks MixtLupus – check out his blog here), it turns out that Wi-Fi does indeed stand for Wireless Fidelity. I couldn’t access the knowledge base (anyone who can and sends me a screenshot, I will be indebted!) but here is the small piece that I could see.